Why am I having problems with my Cantaloupe plant and my Yellow Squash? I had to pull from the garden because it died. I am having problems with growing watermelon and they died. Everything I grew in the vegetable garden had some plants that made it but the ones I mention above. It sounds like all the plants you are having problems with are cucrbits, members of the plant family that includes squash, melons, and cucumbers. 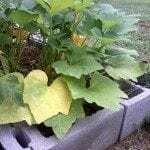 These plants can be infected with many of the same diseases, so maybe a cucurbit disease struck your garden. In any case, remove all the dead plant material to make sure disease won't spread. If there is a disease, it is best to not plant any cucurbits for the next two years and focus on growing other plants.